Whether you own a business or a home, you are well aware how important security is and the security cameras have been the saving grace for home security systems for long. They act as deterrents for burglary attempts which is a good thing with crime constantly on the rise. But security systems and cameras can be expensive especially if you intend to include special features. Because of this, many turn to alternative ways to ensure security such as using fake security cameras. Fake security cameras are look-alikes of real security cameras. They work to trick the criminals into believing that they are real security cameras and in turn, act as a deterrent. The fake security cameras come in different styles, types, sizes and colours for you to choose from. Some even go as far as to include special features such as fake pan, tilt, and zoom to make it look more real. Usually, such camera is designed with relatively basic features. They come with a plastic lens, one or two cables, a sturdy metal body, and a seal of legitimacy. It takes some time to carefully consider all the choices available from different retailers and determine which one is the best for you. But before that, you have to make a decision on whether fake security cameras are a good option for security solutions or not. If budget is not an issue, you can combine fake and real security cameras like these ones. Arrange, position, and point the real security cameras in the areas of your home or business that you want to monitor such as the main gate, the entrance, the front door and the front yard. The fake cameras can be placed in the areas that do need constant lookout to play the decoy. Ensure that the fake cameras blend in well with the real cameras to avoid detection. They are easily identifiable to the trained eyes. Some fake security cameras come with a blinking red light which is a prominent feature right in the front of fake security cameras. The red light is there to serve as to enforce the illusion of real security cameras but it is advised not to invest in fake security cameras with this feature. That is because most of the real security cameras like these mentioned here do not come with a red blinking light feature. Any experienced criminal will easily be able to tell a real security camera from a fake one simply because of the red light. And if the camera fails to hone onto a single person and follow their moves, it can easily give away the trickery of fake security cameras. That wouldn’t be much of help for security purposes. They may come with possible legal implications as they create a false sense of security for employees. residents, and visitors to the building. This may lead to lawsuits as in the event of a crime, the victims can accuse the owner of misleading them into believing they were safe through security cameras which were fake. They don’t cover footage. In case, the burglar identifies the fake security camera and commit the crime, there will be no proofs, no faces to identify without the footages. The law enforcement would need footages but fake security cameras are just that, fake. And if wannabe criminals get a whiff of that then your place might be even more vulnerable to robbery. They create a false sense of security. They won’t provide real peace of mind as it is taking a chance in the hopes that criminals will fall for the trick. It also leaves you vulnerable to the people close to you or those that wouldn’t hesitate to break your trust to take advantage of the fake security cameras. The most obvious would be to install real Security Cameras and the best is investing in a Home Security System. If budget is a concern, there are plenty of affordable and functional/ real security cameras and camera systems like Zmodo Wireless Security Camera that comes at just under $100, you can look up online here. Setting up motion-activated light is also very helpful in deterring possible intrusion. If you can afford to get a well-trained guard dog, that will be even more helpful. That is one of the best defenses against the break-ins. The modern use of smart locks for your doors is one of the basic security measures that you can take. Crimes involving violence are on the high rise. In such cases, prevention is better than cure. Being prepared is one of the best ways to avoid and deal with unwanted situations. 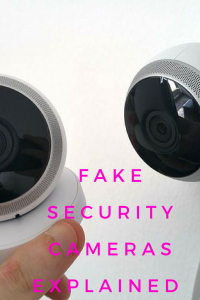 It has been very well argued many times that having fake security cameras is better than having no security measures at all and most of the fake security cameras have the same benefits. They are easy to install and are inexpensive so they are a good and obvious choice especially if you are on a tight budget. But their drawbacks should also be considered. The drawback being that in the event you actually need security, the fake security cameras would provide none. In such event, you have to ask yourself, is it worth the risk?